With the sun and warm weather in full swing, it is time to break out the grill and enjoy the outdoors. This meal is a hearty and delicious way to enjoy Southwest Sunshine Burger patties. It’s a fast and filling meal to replenish after a long day of hiking or wakeboarding. This recipe serves 3, but makes extra guacamole so invite over your friends, bust out the corn chips (and the grill), and enjoy with a cold beverage in hand. Place all ingredients in large bowl, mash avocados and stir in ingredients until combined completely with a chunky consistency. For each sandwich, spread 2 tbs of bean mixture on bottom bun, then layer on the Sunshine Burger. 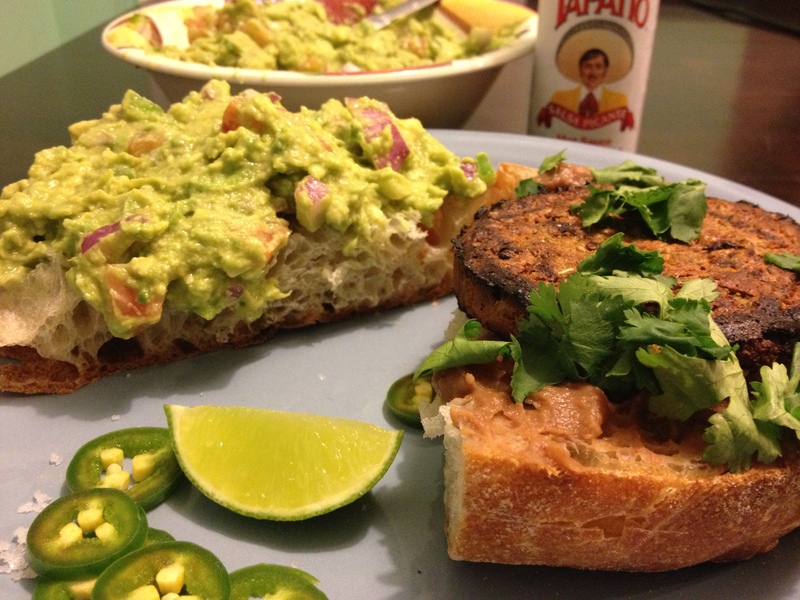 On the top bun spread 2-3 tbs of guacamole, top with hot sauce, sea salt, jalapeno slices, cilantro or onion if desired. Place the top bun with bottom portion of the sandwich, repeat 3 times, and enjoy with friends and family! This entry was posted in Dinner Recipes, Vegan Recipes, Vegetarian Recipes and tagged avocado, BBQ, beans, cilantro, grilling, guacamole, hiking, hot sauce, jalepeno, limes, Mexican food, sea salt, Southwest Sunshine Burger, vegetarian dinner ideas, wakeboarding. Bookmark the permalink.